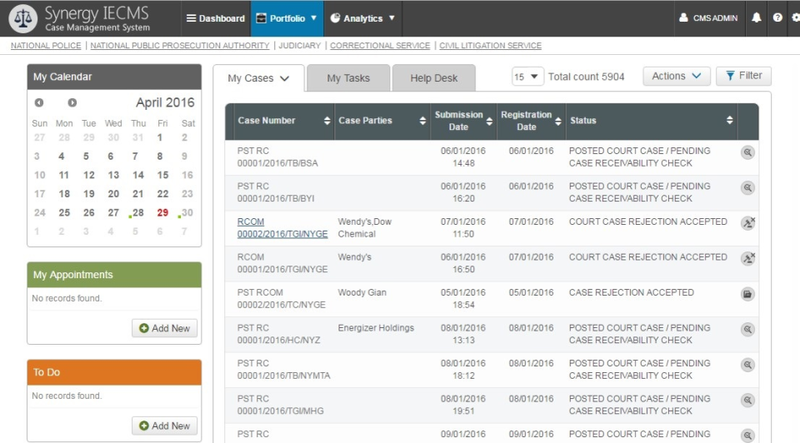 Synergy Case Management System (CMS) is a powerful software that automates and modernizes the work of justice sector institutions in civil, criminal and administrative domains. 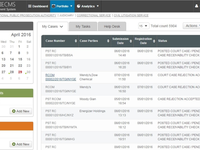 It enables moving from traditional paper-based case filing to automation of the entire case lifecycle, reduces case backlogs and helps handling more cases in less time. CMS provides a complete set of functionality including data entry, e-filing, case workflow management, scheduling, analytics and reporting. Comments: The system is fully integrating 5 institutions of justice sector (police, prosecution, courts, civil litigation and prisons) plus litigants across the country and overseas. Information access and sharing is just by simple clicks. The population of Rwanda is currently 11 million, the institutions are around 149 police units, 78 prosecution offices, 82 courts, civil litigation office, and 10 prisons country wide. It is workflow based and role based fully incorporating the whole case life cycle and additional components such as tasks, appointments and follow up. It is fully customizable. Rwanda is a developing country which is accommodating to change in law and way of work, this system is just what we needed since we can easily modify modules. The system's reporting is the best and strongest module of the system. 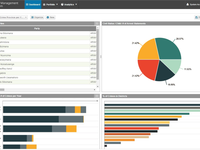 By simple drag and drop, it allows for accurate reporting to be delivered in different forms such as lists, reports, cascades, charts, bubbles, etc. 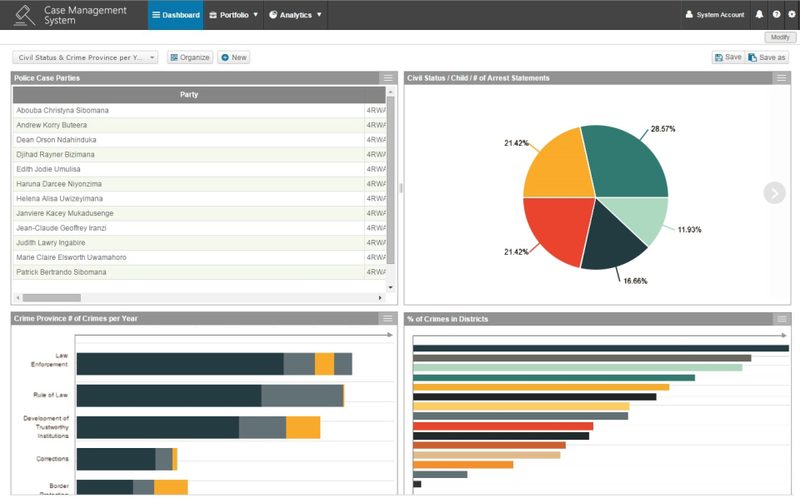 Better still, is its dashboard module that enables users to visualize multiple reports on one window for better decision making. 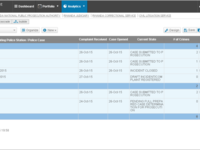 The system allows litigants to easily access and followup on all cases in which they have ever party. Transfer of cases from an institution to another or from a court to another anywhere in the country is just by simple clicks reducing transport costs and serving cheap, fast and effective justice. It is highly responsive, accessible to all devices; phones, tablets and computers. The end users love this system. It helps them efficiently do their work with so much ease. Thanks to synergy. Like any other electronic system, it requires power and internet which is still difficult for some litigants and courts to get. However, Rwanda has laid a nationwide fiber optic and in the very near future, this will not be much of a challenge. 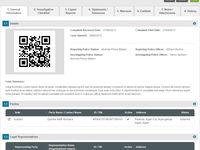 I have worked with this system and had the pleasure of training it to end users (judges, registrars and court inspectors). My experience has been awesome and we hope it can be extended to the rest of the world. His excellency the chief justice said, "This is the kind of system suitable for Rwandans because Rwandans deserve the best". I also had the pleasure of presenting this system (among the many courtroom technologies in Rwanda) to court delegations from Uganda and Burkina Faso and they were particularly fascinated by the case management system. It is simply an absolute beauty in itself. 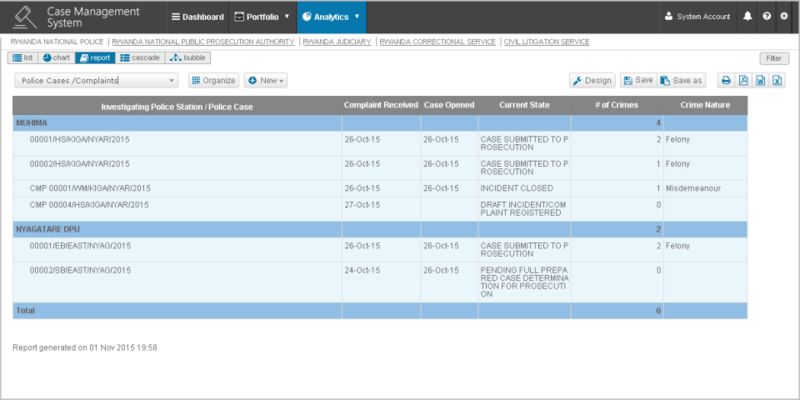 Comments: The Lesotho Case Management System has been designed and developed by Synergy International System. It is currently operational at 3 sites, High Court, Commercial Court and Magistrate Court in the Maseru district. Overall the system functionalities are satisfactory to us as they align with the Lesotho Judiciary business functions and requirements. Since the introduction of this system, Management is able to make informed decision since system allows them to create reports in any form they want them to appear; because you can customize them in any format: Bar chart, Pie Chart, report format. 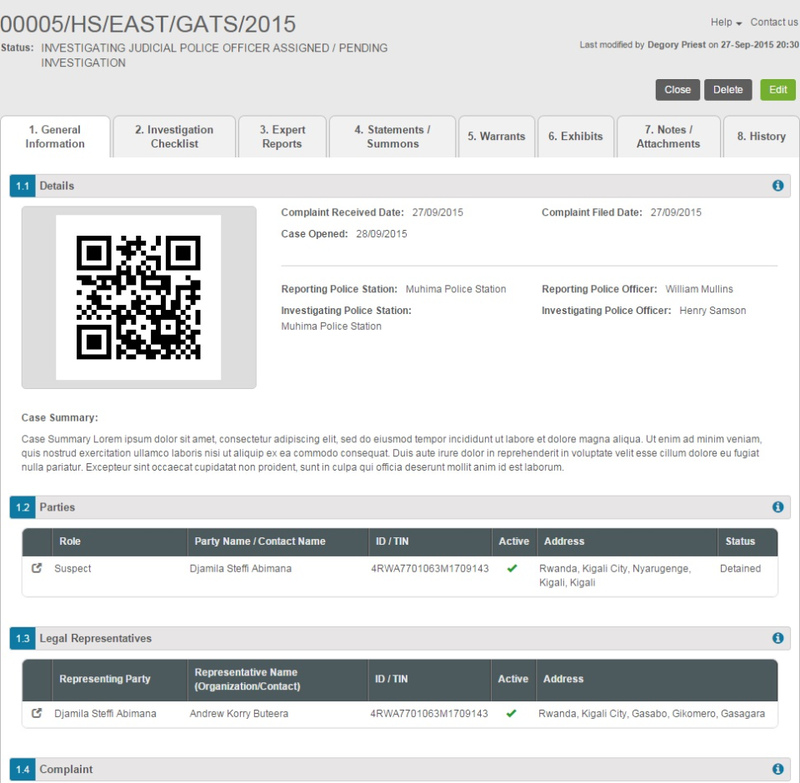 It is user friendly and very easy to use and has contributed significantly in a proper case management and tracking of files or cases. It has resulted in the acceleration of case processing and the workflow is now in a systematic manner. Thus resulted in efficiency and effectiveness of the court staff. In the same light our clientele is satisfied with service delivery since the introduction of this system. It has further resulted in the equal distribution of work load since the system allocates the case automatically to the Judicial Officers as oppose to the past where allocation was manual and bias. We have also received proper training on the usage of this system and the support on post implementation which has further made it easy and encourage our staff to use it. We are so happy and satisfactory by the after sales service we receive on the system and its functionalities. The Lesotho Judiciary is not the same post the implementation of the Case Management System as it responds to our business functionalities and requirements in overall, suffice is to emphasize the ease use has resulted in support staff using it effective. Comments: Synergy`s CMS integrated for 5 institutions of justice sector of Rwanda has all the capabilities necessary to fully automate judicial and administrative procedures. The system is fully customization. 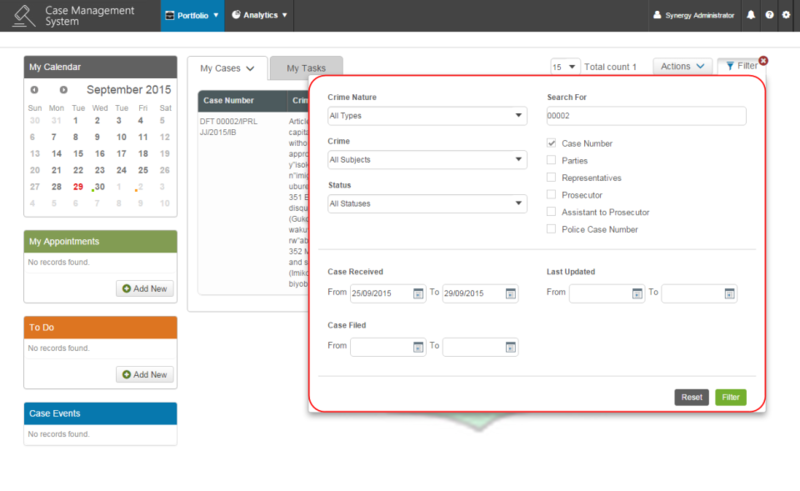 The system helps to provide case information to case parties through a user-friendly web portal. It was quite easy to learn how to use the system, how to create ad-hoc reports, necessary monthly statistics and reports on daily activities. Also data can be easily collected and exported, as just by selecting several criteria you can get your desired report, also avoid duplication and reduce operational costs. The system also helps us to save time, such procedures as transfer of cases from an institution to another can be done just by one click. I think this is also very essential and useful tool of the system. Moreover, the information on the legal cases is standardized and stored in the centralized database which makes the access and review of any legal case easier and faster. The CMS is very useful for having transparent judicial procedures. This is definitely very essential for getting clear and precise understanding of the procedures. We would like to acquire the offline version of the system, otherwise the system fully met our expectations. 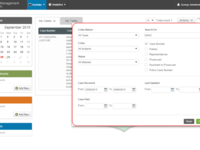 CMS is a wonderful system for e-filling and case workflow management. it has agood reporting system. The system is easy to use and it's a fully fledged system with all the necessary tools embedded in it.